A this website you can follow Faith's progress by subscribing to the blog, stay informed and updated with information upcoming fundraiser events, send a gift to help offset Faith's medical costs, and even send Faith a note! Our daughter Faith really began to blossom in 4th grade! She was elected as a Student Council representative, she had a big speaking role in a play at school and she was a big hitter on her softball team. 5th grade brought more to be proud of. Faith was the only pitcher on her softball team and she was good! She worked hard. She completed a 5K “Girls on the Run” program with her favorite teacher, and was active in Girl Scouts and in her schools running club. She was on the honor roll. 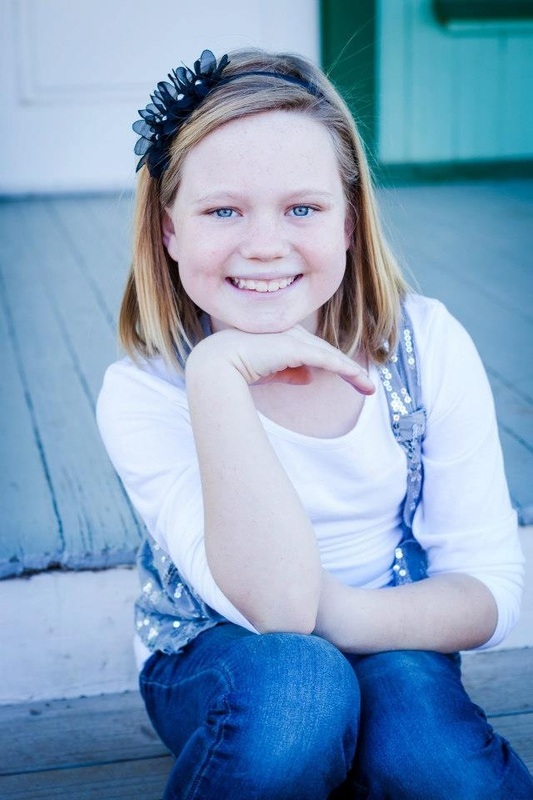 Faith has a large circle of girlfriends and great neighbor kids who loved to spend time together playing, swimming, ripsticking, shooting hoops, jumping on the trampoline and playing baseball in the front yard! Just as Faith began 6th grade, her last year at Sanborn where she has been since Kindergarten, the big cheese on campus, she began to limp. It was barely noticeable at first and we thought she was just trying to walk with that teenage swagger. Chandler and I would ask her to walk straight, but after a week Faith admitted that it was beginning to hurt. Her pediatrician ordered an x-ray at 4pm on a Friday with the expectation that we would have results Monday or Tuesday. Well, that Friday, just barely an hour later, he called us from his home to tell us that the film detected a lesion just below the head of her left femur and that Phoenix Children’s Hospital was expecting us shortly where we would meet with an Oncologist and Hemotologist. What?!? No!!! This is not happening! How could our beautiful, talented, loving, baby girl who was liked by all of her teachers, loved by all of her friends and adored by all of her family have something as nasty and vile as a lesion on her leg? What is a lesion anyway? Click HERE to "Like" Faith's Facebook Page! We scrambled to make arrangements for Kady, Faith’s 8 year old sister, alert our neighbors and close friends, and make the difficult phone calls to our families. Confusion and Fear dominated. By 8pm Chandler, Faith, and I were at PCH and being admitted to the 7th floor. The x-rays were repeated, blood was drawn and an MRI was scheduled. Then we waited and waited with question marks and what if’s dominating our thoughts. Thankfully, Chandler’s sister, Wendi flew out from Missouri. Her career as an OB/GYN helped us to translate what the doctors were looking for and trying to rule out…cancer. By Sunday, we had met with Dr. Seidel, the pediatric orthopedic oncology surgeon (Wendi nicknamed him POOS! ), who gave us a little glimmer of hope that we might not be facing what we all feared the most. He scheduled a biopsy for the following Friday and anticipated results the middle of the following week. On Monday afternoon, August 12th, just 2 weeks after the limping began, Dr. Seidel called me to tell me that the lesion was a Ewing’s Sarcoma, otherwise known as bone cancer. NO! No! No, no, no, no, noooooooooooo! Please, no! Dear God, we are sorry that we haven’t been going to church! We are sorry that we drank too much wine last weekend! We will give more to charity. We will stop using bad words just please, don’t let this be happening to our baby. Give it to us. We will take it twice, in both legs! Just….NOOOOO! But, yes. Faith has cancer. Our biggest fear always. Bigger than abduction, bad grades, drugs….Worse. This could kill her. It’s not likely, of course. Statistics say she has an 80-90% survival rate, but Chandler and I can’t help but realize that also means she has 10-20% NON-survival rate. We know that we need to stay positive. We know that despite the fact that our happy little lives on Oakland street with our 2 little blondies, our chocolate lab, full time jobs, and little white envelope of cash we’d be saving for a November trip to Disneyland for just the 4 of us are over. Well, not over, just turned upside down, inside out, and delayed for at least a year while we fix it. We will fix it. Of course, we will. We have to, that’s the only option. WIN! Win, win, win and show this little pesky Sarcoma who is in charge. *Sigh* now that the pity party is over and our new reality has set in, we are finding the little and big joys in our lives. The biggest is LOVE. We are loved! All four of us have realized that the friends we knew loved us love us more than we ever imagined and the friends we didn’t know we had, love us, too! HELP. Our families are willing to do whatever we need and even things we don’t need. Our jobs are not just financially supporting us, but emotionally, as well. Our neighbors and friends will feed us, cry with us, laugh with us (have a little wine with us) and be there to sit with us when we know we need it and sometimes when we didn’t know we needed it. HOPE. Faith is a strong girl. Stronger than us most times. She has a good name, a pure heart and a great village that will hold her up, carry her along and cheer for her all the way. She has a great team of doctors and nurses at PCH who we have already bonded with and trust. We WILL be ok, different for sure, stronger hopefully, but undoubtedly ok!